How to encrypt split PDF files after splitting with A-PDF Split? I usually use A-PDF Split to split large PDF files into smaller pieces. And my PDF files are of confidential class, so I add password to secure all my PDF files. And I wonder how I can encrypt the separate PDF files after splitting. With A-PDF Split, you can split a PDF document into separate PDF files in one minute. 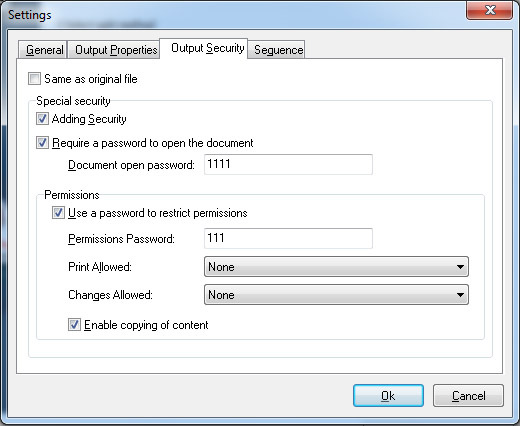 And you can set security to protect the output PDF files from unauthorized uses. It is very easy to encrypt split PDF files while you are splitting the large size PDF using A-PDF Split. Click the "Browse…" button to browse PDF file in your computer and select a PDF file that you want to split. You can select all pages or a range of pages to split. There are multiple split methods for you to choose: by every N page(s), by bookmark, extract page(s), remove page(s), collating every N pages and advanced mode. You can select a name pattern and output folder for the split PDF documents. Click "Settings" and in the pop-up window, click "Output Security" tab. If you want the split PDFs have the same password as original PDF, check "Same as original file"; otherwise, uncheck that option and check "Adding Security" and set password to open PDF files and restrict permissions for the PDF files: Print, Change and Copy. 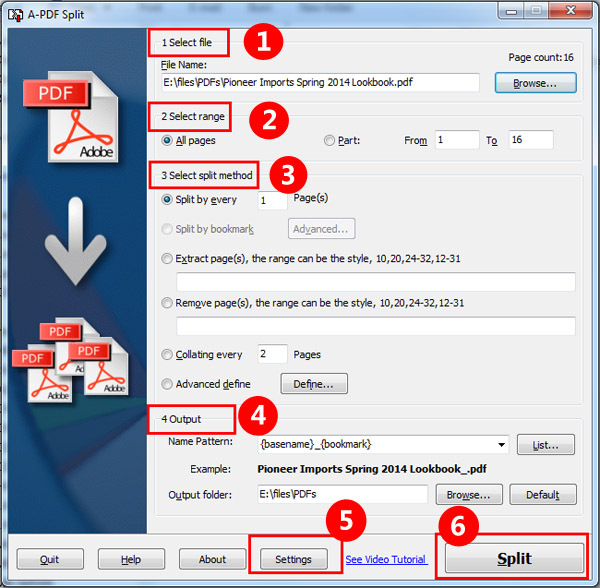 Click "Split" to begin splitting the PDF into separate PDF files with password security.